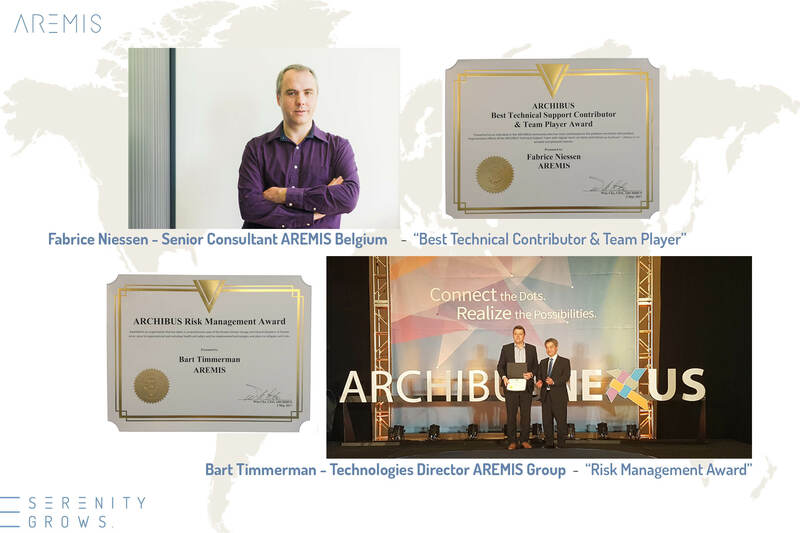 AREMIS - AREMIS & ARCHIBUS Nexus 2017 in may in the USA : proud of our two colleagues ! AREMIS & ARCHIBUS Nexus 2017 in may in the USA : proud of our two colleagues ! Not one, but two great surprises ! Each year, ARCHIBUS organizes an international convention in the United States. In 2017 ARCHIBUS Nexus took place in Maryland from April 30th to May 3rd, and reunited the major players in the ARCHIBUS community. More than 400 enthusiastic actors participated in this global event. congratulations to Bart and Fabrice! "Best Technical Award & Team Player" to Fabrice Niessen : presented to an individual in the ARCHIBUS community who has made the biggest contribution to the problem resolution and product improvement efforts of the ARCHIBUS Technical Support Team with regular Wish List items and follow-up feedback – always in an amiable and pleasant manner. "Risk Management Award" to KBC Bank & Bart Timmerman for the compliance study : given to an organization that has taken a comprehensive view of the threats climate change and natural disasters, or human error, pose to organizational and individual health and safety and has implemented technologies and plans to mitigate such risks. ABOUT ARCHIBUS NEXUS : it is the focal point of ARCHIBUS efforts to provide training, shared user experience, and benchmarking for ARCHIBUS clients and service providers from around the globe. Throughout the year, members of the ARCHIBUS community participate in local user groups, international Special Interest Groups (SIGs), regional meetings, and targeted training courses to develop professionally. NEXUS includes two distinct events: a 2-day meeting of ARCHIBUS Business Partners (Nexus Connect), followed by 4 days of Nexus Conference and University sessions which are scheduled concurrently for clients and partners. At "Connect" sessions, Business Partners share their global experience and develop benchmarks for services. "Conference" sessions provide client insight and experience across industries; and "University" sessions, led by ARCHIBUS staff, focus on product knowledge. The next conference will take place in Boston. The user event will be preceded by ARCHIBUS Connect, the Business Partner Event. It will run from April 8th to 11th 2018 at the Boston Marriott Copley Place.